‘Pioneering Spirit’ Project Starts With Putin’s Kicks Off. 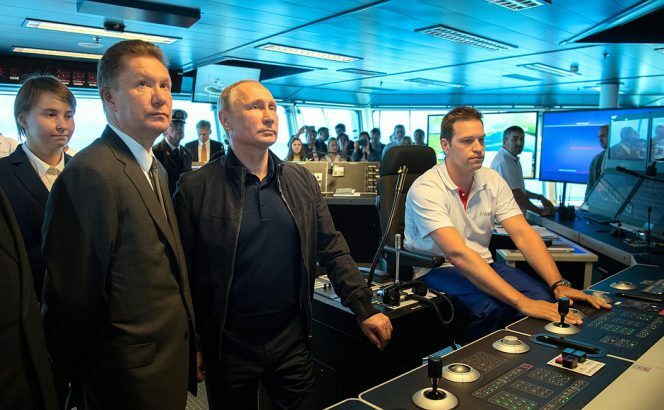 Russian president Vladimir Putin has symbolically launched the process connecting the shallow and deepwater sections of the TurkStream pipeline in the Black Sea. According to the Kremlin statement on Friday, Putin launched the process from aboard the Pioneering Spirit, the world’s largest offshore construction vessel, in the presence of Alexey Miller, Gazprom CEO. After the launching, Putin was taken on a tour of the giant vessel, after which he held a working meeting with Miller, where they talked about the technical specs of the pipeline. The Pioneering Spirit will install two, 900 kilometer long pipelines on the seabed in water depth of 2200 meters. The twin-hulled, 382 meters long and 124 meters wide vessel was awarded a contract to lay the first line of the TurkStream offshore gas pipeline in the Black Sea, with an option for laying the second line, in December 2016. Then in February Allseas also inked a deal to build the second string of the TurkStream gas pipeline’s offshore section. The offshore pipeline which will carry Russian gas to Turkey, will consist of four parallel pipelines running through the Black Sea. The pipelines will enter the water near Anapa, on the Russian coast, and come ashore on the Turkish coast some 100 kilometers west of Istanbul, near the village of Kiyikoy. Pioneering Spirit – one of the largest ships in the world – can lay five kilometers of pipelines a day at a depth of two kilometers.